No. 1 & 3, Jalan Mutiara Emas 5/25, Taman Mount Austin, 81100 Johor Bahru, Johor, Malaysia. 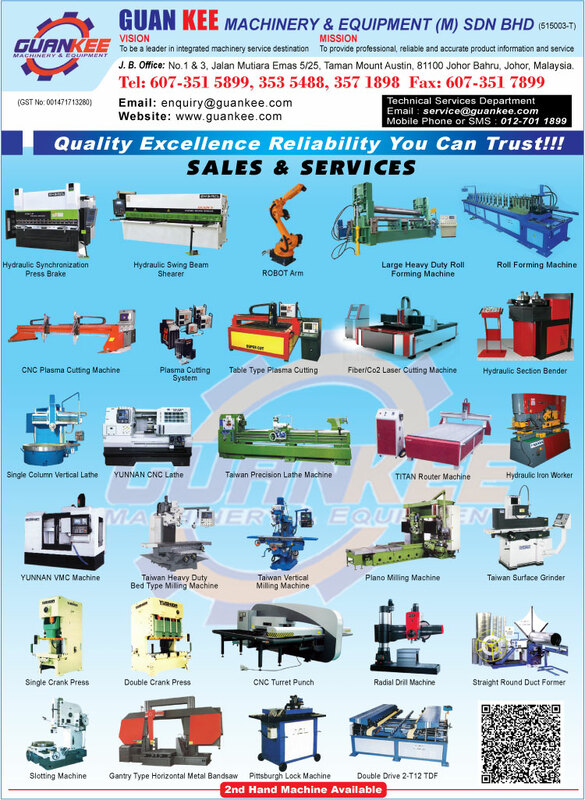 Guan Kee Machinery & Equipment (M) Sdn Bhd has been well known in industrial market since 1982. Guan Kee Machinery & Equipment (M) Sdn Bhd are specializing in supplying full range of machinery and equipment used in sheet forming, duct making, steel manufacturing and much more industrial machine such as Plasma Cutting Machine, Power Press Machine, CNC Machine, NC Press Brake Machine, Shearing Machine, Roll Forming Machine, Slitting Machine etc. Guan Kee have more then a 25 years experiences in supplying industrial machinery start from a small trading company, and now Guan Kee Machinery & Equipment (M) Sdn Bhd had been proud to become SOLE Distributor in Malaysia for ACL Machinery Group from American - The One of Largest Developer of Machinery Products In The World in supplying full range of ACL Machinery. Not only Malaysia, Guan Kee Machinery & Equipment (M) Sdn Bhd has also supplying ACL products to other country in South East Asia.